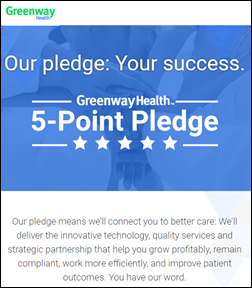 Greenway Health will pay $57 million to settle Department of Justice allegations that the company falsified the certification process for Prime Suite EHR and paid kickbacks to customers who recommended its product. DoJ accused Greenway of falsely obtaining 2014 Edition certification by modifying its software to look as though it used standardized clinical terminology. DoJ also says Greenway failed to correct an error in its calculation of the percentage of patients who were given clinical summaries, allowing Prime Suite users to inappropriately earn EHR incentive payments. From CICIO: “Re: CHIME. In between extended breakfasts with consultants, strategic vendor partnerships lunches, and evening bashes to unwind from the long day, CHIME members can earn up to $2,400 by participating in focus groups while at HIMSS. To acquire that windfall you do need to spend almost 20 hours sequestered in hotel meeting rooms with vendors, so value will be in the eye of the beholder. There should be time to get to the booth of the vendor showcasing the AI powered blockchain bots for patient engagement.” I really dislike the idea of encouraging vendors to buy time with prospects, not to mention the HIMSS practice of segregating CIOs off on their own private conference tracks far from the unwashed so they can charge vendors more for access to them. Any time someone says it’s not the money, it’s the money, even if they do call it honoraria to make it sound less greedy. 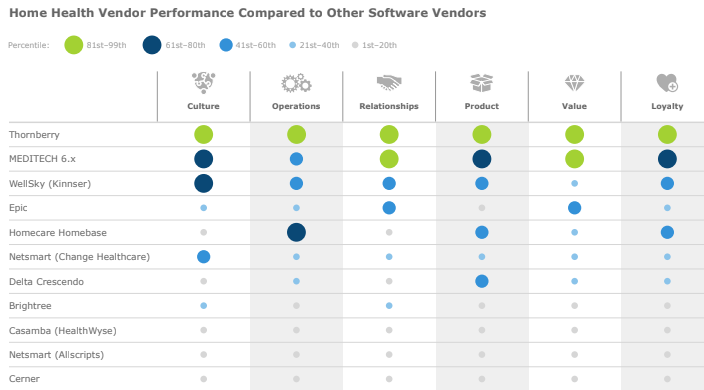 On the other hand, CIOs are paid plenty well enough that earning just $100 for fidgeting through a 90-minute vendor pitch shouldn’t be attractive. I should get someone to take names of the vendors and CIOs who play this rather seedy game. Imagine a CIO having to explain their attendance to patients of their hospitals who can’t pay their inflated bills. From Imran of Imuran: “Re: sports spread. Explain again how it isn’t what people think.” Most sports betting in this country involves bookmakers setting a spread as a risk management strategy. It’s not the consensus opinion of sports experts of who will actually win or lose the game and by what margin, but rather the dynamically recalculated number that will attract an equal number of bettors on both sides. The bookmaker doesn’t care about the game, just having enough losing gamblers to cancel out the winners so they can pocket a predictable percentage as vig without risking wild gains or losses. The spread, therefore, reflects the belief of armchair quarterbacks rather than experts, rather like company share prices. From Groundhog Day: “Re: HIMSS TV. Believe they got the year wrong.” Quite a few readers chuckled at last year’s email that was accidentally and obviously repurposed Thursday by HIMSS Media (you know, the journalism people). Still, I’ll forgive sending the wrong email a lot quicker than the fact that last year’s email called Las Vegas “Vegas,” which I detest since surely even we verbally challenged Americans can spit out three full syllables instead of two. Welcome to new HIStalk Gold Sponsor Oneview Healthcare. 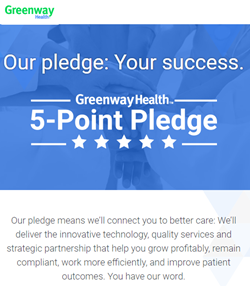 The company’s inpatient solution helps patients (education, meal ordering, entertainment, and video chat) and caregivers (rounding, telehealth consultations, screencasting, and service requests) in improving patient experience, clinical outcomes, and caregiver productivity and satisfaction. It offers the Connect mobile app for outpatients, Pathways for managing clinical pathways, and a senior living solution. 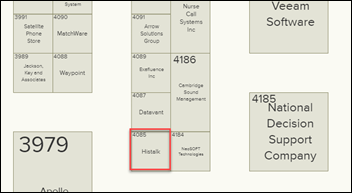 See them in #450 at HIMSS19. Thanks to Oneview Healthcare for supporting HIStalk. It seems like only yesterday that I was turning down whiny hospital users who were demanding that part of our underpowered IT budget be used to replace their CRT monitors with the state-of-the-art, $1,500 15” flat panel versions that we approved only for HIM employees (as IT’ers know, employees are always asking for technology they don’t really need for their jobs in seeking a tangible love token of their value, a practice that will send a lot of people to HIMSS19 next week). 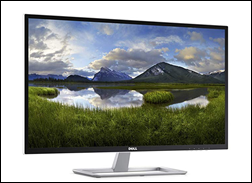 I noticed a monitor deal I couldn’t pass up this week – a massive 32” Dell for $160. It dwarfs the desk, but it’s pretty great if you regularly open several windows on a single monitor (or if you just like to see really big text). It’s been too long since I’ve run outdoors and my previous training app hasn’t been updated for years (even though it’s still listed in the app stores of Apple and Android), so I tried to find a “couch to 5K” type program that includes music to get back into shape without hurting myself. I came up blank except for an app developed by NHS England that unfortunately can’t be downloaded outside that country, as enforced by the app stores. 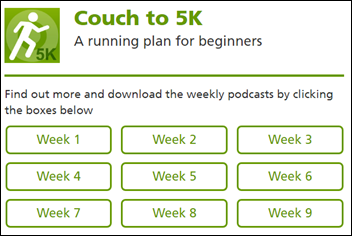 However, NHS offers a great solution – a series of podcasts featuring a trainer’s instruction over music that can be downloaded and played on any podcast player. NHS continues to impress me. Can they open a branch here? I see from a HIMSS email that pre-registered HIMSS19 attendees can pick up badges staring Saturday afternoon at the airport, outside the luggage “carrousels” (interesting spelling). Speaking of HIMSS19, its speakers are dropping like flies as HHS Secretary Alex Azar finds that he can’t unite with all his fellow champions of health after all. 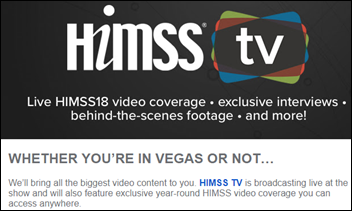 Here’s my HIMSS guide, which will help you find my sponsors in the exhibit hall’s vast ocean of commercial excess and check out their HIMSS19 activities. Lorre will be in #4085, hoping that you wash up as you leave the adjacent bathroom on the way to shake her hand. No offense to our fellow tiny-boothers, but other than National Decision Support, I’ve never heard of any of them. I might have to reconsider spending the money next year since the return is zero and I have to decide based on how much fun it provides. I just realized today that I can post the HISsies winners at any time since there’s no HIStalkapalooza that requires fake drama, so here they are. I won’t run a Weekender on Friday, so we’ll pick it back up here with a Saturday or Sunday post if I have anything interesting, then we begin the snarky booth commentary and skeptical review of mostly pointless announcements that vendors save up for the conference for some reason. Safe travels to everyone going to HIMSS19. Trinity Health will centralize patient billing in a move that will force 1,650 employees to change jobs or relocate. The 22-state health system will also transfer 450 IT employees who support legacy applications to Leidos as it moves to Epic. Orion Health Group founder Ian McCrae plans to take the company private once again after four years on the New Zealand and Australian stock exchanges. He and several other colleagues will form a holding company to buy up the necessary shares to take controlling interest. The company’s stock has fallen since selling off its Rhapsody and population health units to private equity firm Hg last year. Health Catalyst secures up to $100 million in a Series F round led by OrbiMed, increasing its total to $392 million. The new funding gives the company a paper valuation of $1 billion. The company will announce a “refined operating model” at HIMSS19. As usual, it was lower-than-expected low-margin technology resale that caused the revenue miss. I don’t really understand why the company can’t fix this since it bites them every quarter. Maybe they should create a separate company just for technology resale, or perhaps get out of that business entirely if it’s as low-margin as they always say. The company expects that “less than three percent” of its employees will leave under its voluntary separation program. The company added just one ITWorks client in the quarter, increasing its total to 32. ITWorks and RevWorks are single-digit margin contracts. The company formed a separate group to go after big health systems that are buying hospitals and practices and thus want to thin their EHR herd. Cerner will run “kind of an incubator concept” to get ideas to market faster. The EHR replacement market is declining. The company announced that it will start paying a dividend for the first time, saying that 80 percent of comparable S&P companies do it and more investors will buy shares if they earn dividends. Executive bonuses will be changed from just hitting EPS targets to also include revenue and free cash flow. The company expects the VA business to ramp up linearly from $250 million in annual revenue this year to $1 billion in four years. Cerner will look at acquisitions to round out its HealtheIntent platform. Cambridge Health Alliance (MA) promotes Brian Herrick, MD to CIO. MedAptus appoints Susan Sliski, DNP, RN (Harvard Pilgrim Health Care) as CNO. Jay Colfer (Acorn Credentialing Solutions) returns to The SSI Group as COO. Kevin Weinstein (Analyte Health) joins Apervita as chief growth officer. 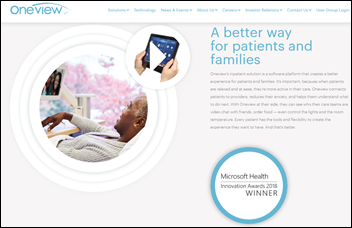 HIE NY Care Information Gateway selects the InterSystems HealthShare Patient Index. Children’s of Alabama selects medication safety and stewardship technology from Children’s Hospital of Philadelphia spinoff Bainbridge Health. Billings Clinic (MT) will roll out Health Catalyst’s Data Operating System as part of its population health initiatives. Franciscan Missionaries of Our Lady Health System (LA) contracts with Nordic for managed services for its 18 Epic applications. California-based health data network Manifest MedEx will implement HealthShare patient care record software from InterSystems, and de-duplication medical records software from Verato. Atrium Health (NC) will use Koan Health’s population health analytics and consulting services. Reliance eHealth Collaborative, an HIE with members in Oregon and Washington, selects Zen Healthcare IT’s Gemini integration software. MDLive announces GA of MDLive Go, chatbot-managed virtual visit capability that the company guarantees will return a physician-reviewed diagnosis and electronic prescription to the patient within two hours. Mayo Clinic and Leidos will build an accelerator at the health system’s campus in Jacksonville, FL that will foster research, development, and commercialization of technologies and therapeutics. Manifest MedEx rolls out Audacious Inquiry’s real-time Encounter Notification Service. A new KLAS report on home health EHRs finds that while Homecare Homebase and Epic lead in mindshare, Thornberry (for small agencies) and Meditech (for agencies affiliated with Meditech-using health systems) top the satisfaction list. After learning that the VA’s EHR project could balloon beyond its estimated $16 billion budget, lawmakers call for an interagency leader to oversee the EHR overhaul and integration efforts of the VA and DoD. The Interagency Program Office has assembled a task force to determine how to move forward with accountability for both projects and will release its findings by the end of the month. 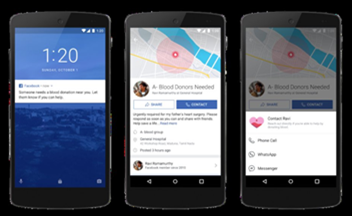 Facebook will launch a tool that will allow hospitals, blood banks, and the Red Cross to ask for blood donations. Users who opt in will receive notifications of blood shortages in their areas. The company launched a similar feature in Brazil, Bangladesh, Pakistan, and India, where users are allowed to approach one another with donation requests – a capability that has led to several shady black market blood deals. An NHS report determines that aging IT systems have become detrimental to the health service’s 11 screening programs, which are maintained by a legacy database that depends upon a variety of IT systems that are between 10 and 30 years old. NHS came under fire last year for an IT oversight in its breast screening program that resulted in a failure to encourage 122,000 women to obtain screenings over a nine-year period, likely contributing to the early deaths of 270 women. Formativ Health’s enterprise-wide scheduling solution, DASH, is now available on the Salesforce Appexchange. With the help of Meditech’s integrated supply chain functionality, East Tennessee Children’s Hospital will save $1.3 million in costs this year. Clinical Computer Systems, developer of the Obix Perinatal Data System, will exhibit at the Society for Maternal *Fetal Medicine February 11-16 in Las Vegas. PatientBond identifies five psychographic segments through analysis of its fifth national market research study of healthcare consumers. VentureFizz profiles PatientPing and its new Boston headquarters. CB Insights names Qventus as one of 2019’s 100 most innovative AI startups. Sansoro Health’s 4×4 Health Podcast convenes experts to discuss health IT predictions for 2019. DrFirst and Meditech partner to give EHR users the ability to access California’s Cures 2.0 PDMP. SymphonyRM will sponsor and present at the Healthcare Marketing & Physician Strategies Summit May 21-23 in Chicago. TriNetX benefits from Snowflake’s data warehouse built for the cloud. Spectralink certifies Imprivata’s Mobile Device Access for its Versity enterprise smartphone. HGP publishes its January health IT insights. Nuance rolls out its virtual assistant technology to Dragon Medical One users. Holy Redeemer Health System expands its partnership with Prepared Health’s post-acute management EnTouch Network. Meditech adds an Opioid Stewardship Toolkit to its Expanse EHR. PCare integrates Mobile Heartbeat’s MH-CURE clinical communications and collaboration technology with its interactive bedside patient system. Collective Medical names Allison Barlow (Allison Barlow HR Consulting) head of people. Lightbeam Health Solutions releases Version 3.0 of its population health management software.